This is about July. The month of barbecues, deserted beaches and lightly clad women. I wish I owned land by the sea. 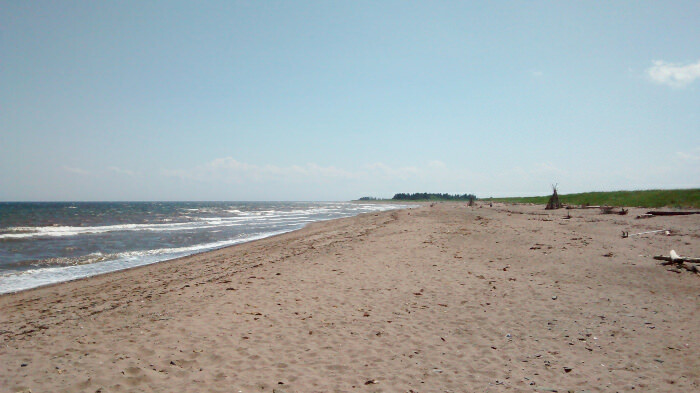 This is one of the beaches I like to visit on hot summer days. I don’t remember mentioning blackflies in the last post. They are a plague. Without protective clothing it would be impossible to be in the garden. Eventually they go away as it gets drier and hotter. Sometimes they come back in early Fall but nothing compares to Spring’s swarm. It’s really nice in July. Sunshine and rain in the garden. 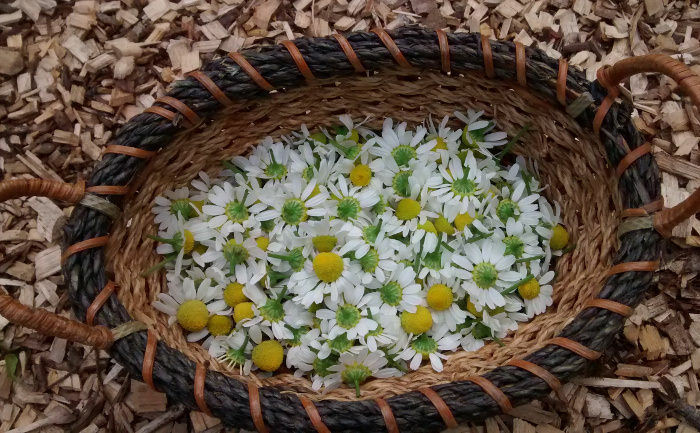 Ricthers offers several varieties of chamomile. I chose Zloty Lan because of its high chamazulene content despite the fact that I don’t know what chamazulene is. One thing is for sure, the plants are beautiful. They liven up the garden a lot and not just with their beauty, they attract lots of bugs. Something big even decided to sleep in the patch. 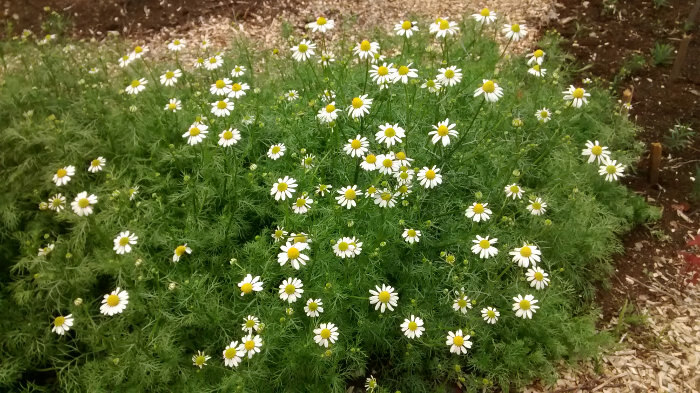 Chamomile is so soft! It must have been a comfy nap. I sowed chickpeas way too early. They didn’t seem to mind the cold in the garage and they grew at least 12″ tall before I could transplant them outside. 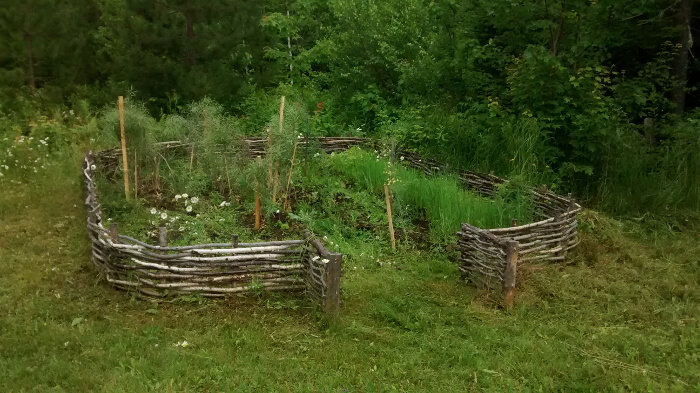 By that time they were cramped in those 2″ soil blocks. Of the 20 I sowed 12 made it to the garden. After a few days outside they all turned coppery brown. Eventually they recovered but I can’t imagine they enjoyed being burned by the sun like that. Next year I will do better I hope. 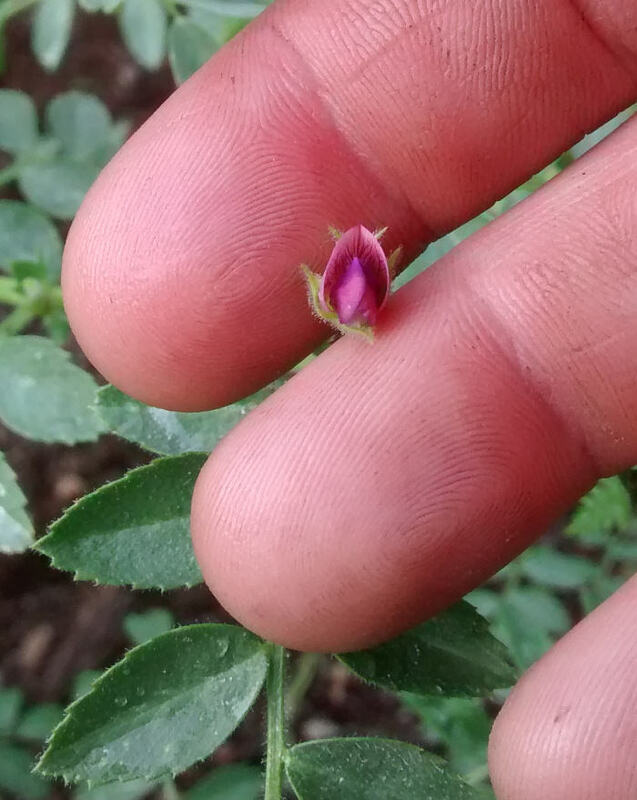 Black Kabuli leaves remind me of a miniature rose I received once. Remembering how brassicas seeds look alike I checked if chickpeas and roses were related. They are both rosids, which is a clade, which is a branch on the tree of life. Good, they are related! But then I read that rosids “comprise more than a quarter of all angiosperms”. Oh, ok. 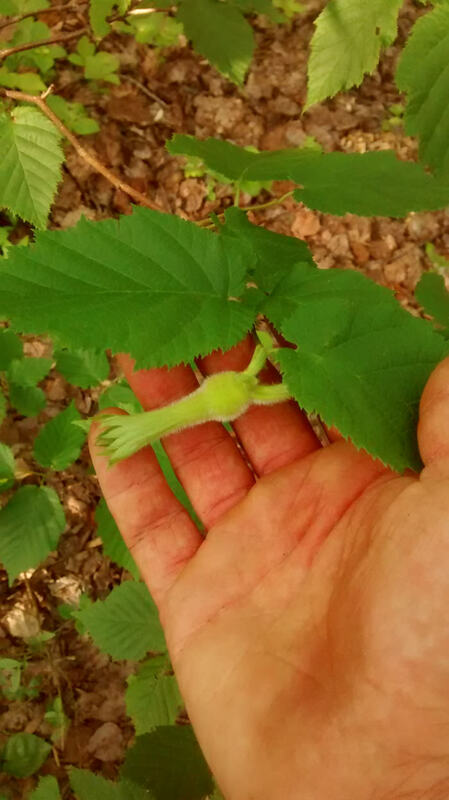 So I guess the leaf resemblance is coïncidence. Learning about Clades, Kingdoms and Domains was fun though. 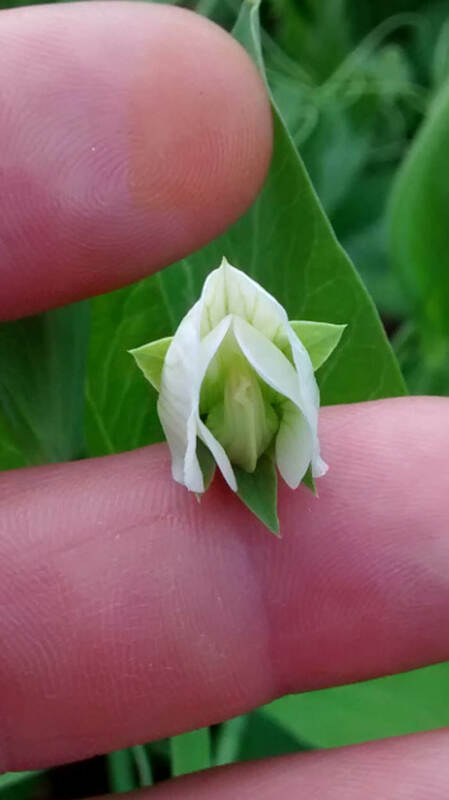 Here is a Sugar Ann pea flower. 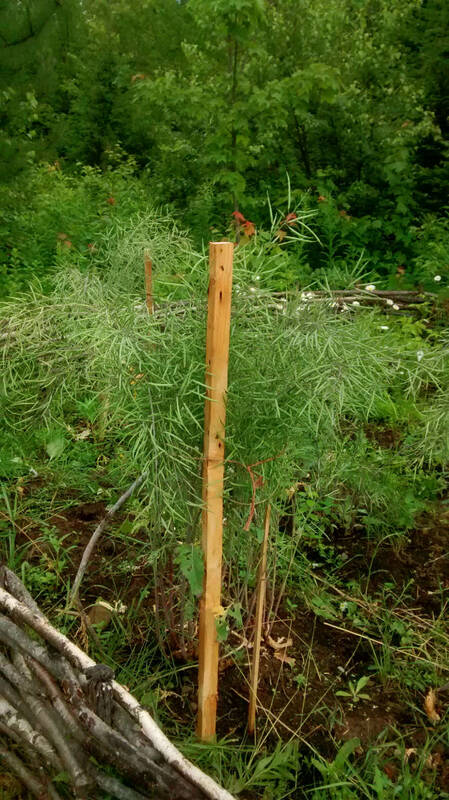 Pea foliage is different from that of Black Kabuli but the flowers look similar. A little fairy bonnet, very beautiful. I like how the sepals frame the flower. On an impulse I decided to get chickens. 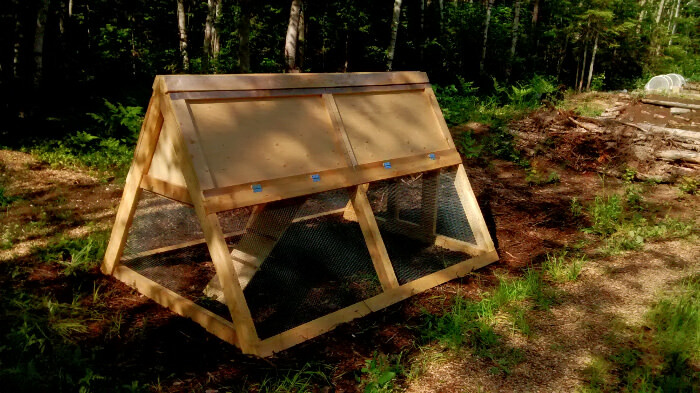 I chose the simplest coop design I could find. It wasn’t difficult to build but I wish I had a flat surface to work on. Squirrel feed. They’ll leave some for me if I’m lucky. The nuts make me feel weird and they’re very small compared with the ones we can buy. I’d like to help them spread. A snake living in the hugel lump. I like animals that run away from me. We’ve been chased by a moose once, funny but not nice. Do snakes run away? “Slither”, I had to look that up. In French you don’t need legs to crawl. This kale was probably munched on by the same critter that ate my wild chicory. It is a bad picture but I wanted to share anyway. 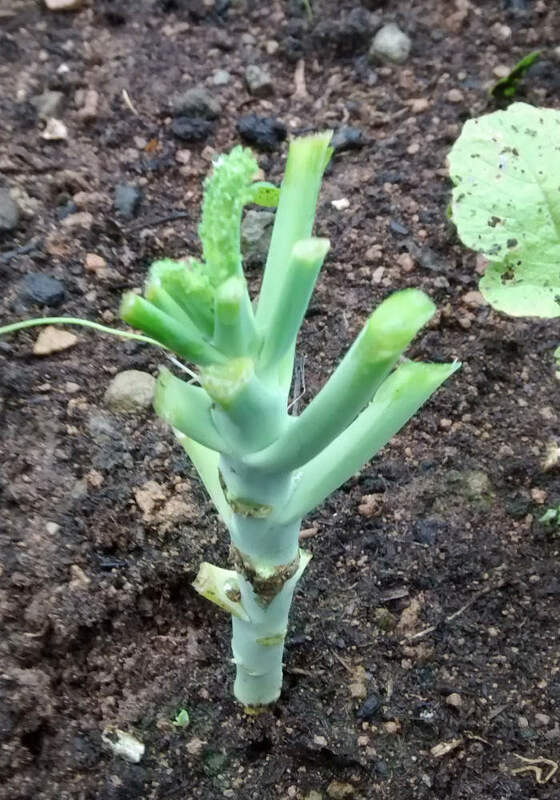 The kale in the old garden is doing better. The garden is full of weeds and looks good in my eye. Red Russian kale full of pods on the left, some Scotch Blue in flowers in the middle, milling oats on the right, daisies and other weeds everywhere. So many pods! Even the slugs can’t keep up. This is it for now but there is more. July is a busy month.